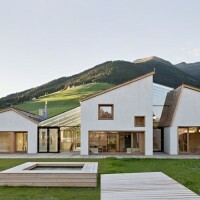 Feld72 Architects have completed a new kindergarten building in Terenten, a mountain village in the Puster Valley of South Tyrol in Italy. 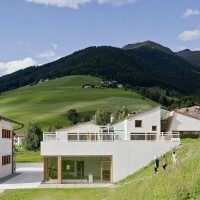 feld72 has built a new kindergarten in Terenten, a mountain village in the Val Pusteria in South Tyrol in Italy. South Tyrol is a border region, a territory which is defined by the overlapping of three cultures: the German, the Italian and the Ladin ones. 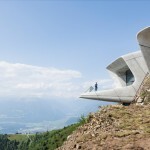 This found it repercussion also in architecture. 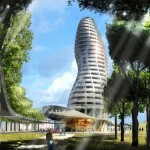 The new building is a mediator between these worlds, starting from the context but transcending it. 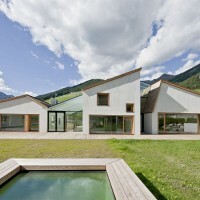 Building in the Alps has always been characterized by a search for the elemental and for the wise use of the topography. The kindergarten is emerging from the ground, on one side a clear building, on the other side already integral part of the landscape. It is related to the scale of the surrounding village, and takes the perspective of the children into account. 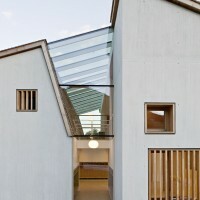 The kindergarten combines the elemental logic of the form with the complexity of its inner and outer space sequences. The building uses traditional architectural elements of the context and translates them into a contemporary form. 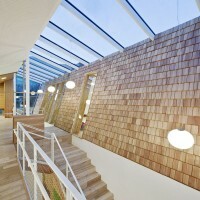 The child daycare centre has been designed as a unique and individual building which nevertheless merges smoothly with the surrounding built environment. From an urbanistic perspective, the design concept is intended to give meaning and identity to this defined space – something special amid an everyday environment – without generating jarringly harsh contrasts. The new child daycare centre is located in an area with public facilities (education, sports). Built on what used to be a miniature golf course, it forms an extension of Terenten’s built-up pedestrian zone. The centre will combine with the municipal offices, the sports hall and the neighbouring primary school to create an organic ensemble. 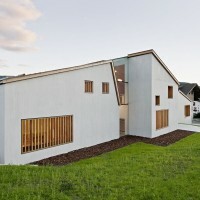 The sloping terrain to the east of the primary school has been used to accommodate a lower ground floor. 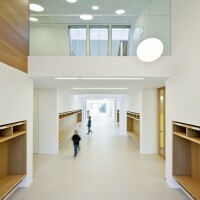 Thus, only half of the required building volume is visible to passers-by, and a new public space has been created between the school and the daycare centre. The eastern front of the school opens onto this space, which can be used during recesses and for official functions. Entry to the daycare centre is from the level of the pedestrian zone. Here on the ground floor level the centre is divided into three “houses”, whose fronts have been shifted slightly out of alignment. 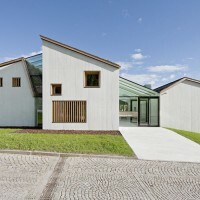 Responding to the architectural context, the three units have varying heights and are linked to each other by means of glazed connectors that are flooded with daylight. 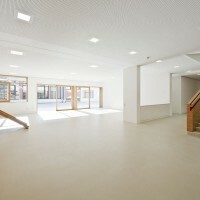 All classrooms are south-facing, while multi-purpose activity areas have a northerly orientation towards the pedestrian zone or a westerly one on the lower ground floor. 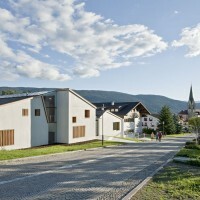 The differentiated building units have been designed in relation to the nearby primary school and their dimensions take into account the perception and identity of the child. 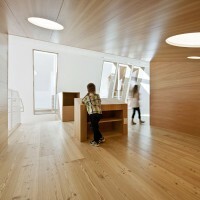 The differently shaped “houses” help children get their bearings and understand the spatial and social organization of the centre. The children feel at home in “their” respective houses. The centre is reached on foot from the pedestrian zone via a level entry area (+3.84m=1,223.8m). The entry level ground floor contains two classrooms, plus sanitary facilities and cloakrooms, the personnel area with two offices, and a multi-purpose area with a “parents’ corner”. 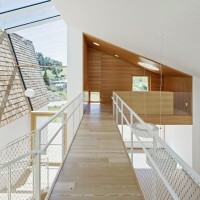 The entry area is situated between two houses. 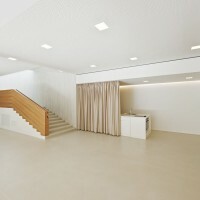 The cloakroom area, which receives ample daylight and can also be used as an additional activity area, is laid out like a small passageway between the two houses. 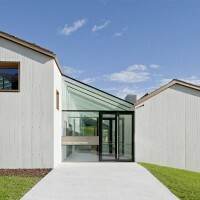 Its many openings connect it to the community life, and it functions as an extension of the public space inside the daycare centre. A staircase and lift connect the entry level floor to the lower ground floor. 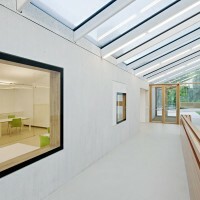 This contains a room intended for physical activities or as a rest area, a second multi-purpose room, a teaching kitchen and a third classroom on the southern front. 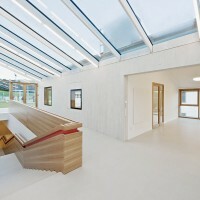 Although only the western and southern sections of the lower ground floor protrude from the sloping terrain, two skylights ensure that ample daylight reaches the cloakroom area and classroom. We have aimed at creating differentiated spatial structures, rooms that provide as much potential as possible to stimulate children’s independent activities, orientation, communication, social interaction and aesthetic receptiveness. 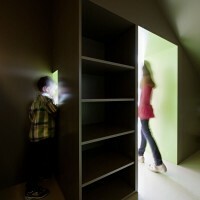 Rooms that can be flexibly used as stages for children’s activities, but also as quiet retreats. 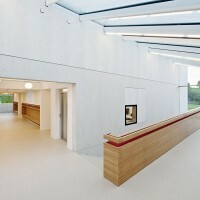 The ground floor classrooms incorporate two levels: with connecting bridges, galleries and air space, they offer a variety of spatial experiences and lines of sight. Larch-panelled galleries sit like birds’ nests on the exposed concrete structures, and two bridges connect to the common physical activity area. 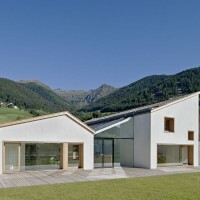 Different views from the windows around the daycare centre pull the surrounding mountain scenery deep into the building. With nearly 80 m2 of floor space, the classroom on the lower ground floor is the largest of the three classrooms. 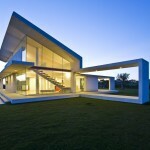 It is designed in simple, clear lines. 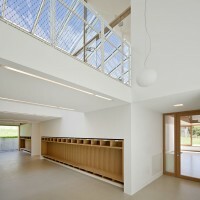 One half of the room opens up conically towards the sky, with light entering unobtrusively via the large skylight. The other half of the room opens up towards the garden on two sides, letting in the outside scenery. From each classroom, the children can access the garden via a wood-decked patio in front of the classroom. The central multi-purpose room is located on the lower ground floor. 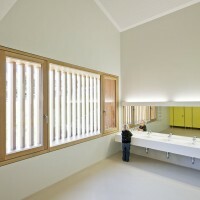 Large sliding doors can be opened to connect it to the open space between the daycare centre and the school. A divider element provides sufficient storage space for materials needed for various activities, but can also be used as a walk-in sculpture by the children, offering sitting niches, wall bars and a fold-away slide inside. Staff rooms are located close to the entrance in one of the three “houses”. The kitchen is located on the lower ground floor, deliveries can be made from the adjacent open area. Responding to the sloping terrain, the child daycare centre becomes a hybrid creation, a cross between built structure and landscape: indoor and outdoor spaces flow into each other, and the roof has been turned into a garden space accessible from the upper floor. Beyond, the natural landscape outside merges with the playground. The adjacent playground and park and the nearby meadow and forest areas provide an extraordinarily rich variety of open spaces for the children. The choice of materials has been based on the guiding principle of building something special amid an everyday environment. Traditional elements have been reinterpreted from a contemporary perspective to create new qualities: the building takes up time-honoured patterns and combines them with new phenomena of global modernity. 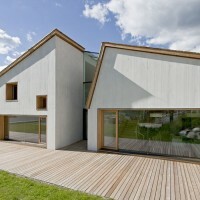 All outer building walls are double-layered, exposed white concrete; wood formwork was used for construction. 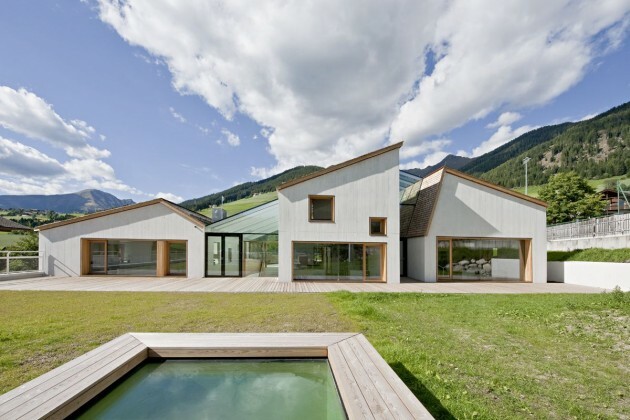 Roofing is made of hand-cut larch shingles. Part of the lower ground floor wall is covered in vertical larch cladding that surrounds the large window openings. Exposed concrete has also been used for the entry area, making for clearly delineated built structures. 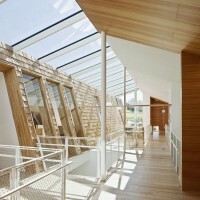 Wood has been used exclusively for the gallery level. Thanks to its compact construction, optimized insulation and choice of materials, as well as installation of a hygienic ventilation system with significant heat recovery rates, the building has received an excellent energy efficiency rating (“KlimaHaus A”, i.e. heating energy requirement less than 30 kWh/m² p.a.). 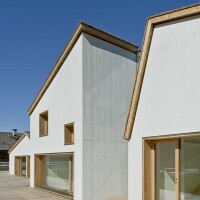 The daycare centre is connected to a remote heating facility which runs on wood chips, i.e. a renewable energy source. 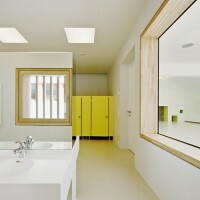 Within the building, heat is distributed via an underfloor heating system, ensuring maximum comfort for the children. High air quality is maintained by means of a mechanical ventilation system which has been designed to meet the hygienic requirements and deliver high heat recovery rates, further reducing heating energy consumption. Lighting and temperature control for the various rooms and areas, as well as shading of the glazed areas, are controlled via a bus system which is also designed for optimum user comfort and energy efficiency. 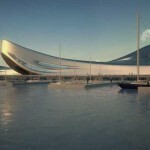 Visit the Feld72 Architects website – here.